The What: Christie has launched the DS Series, a trio of mid-brightness 3LCD laser projectors: the LWU755-DS, LHD878-DS, and the LWU900-DS. The What Else: Needing only one motor, the LWU900-DS/LHD878-DS projectors are affordable, mid-brightness 3LCD laser projectors. Delivering 9,000/8,775 lumens and a 4,000,000:1 contrast ratio in WUXGA/HD resolution, these two projectors are well suited for medium to large spaces or high ambient light environments where greater brightness is required. The Christie LWU900-DS and LHD878-DS accept 4K at 60Hz signals, have built-in edge blending and warping, and feature a low-power mode for up to 50,000 hours of operation. Small, light, and featuring omnidirectional capabilities, these projectors are easy to install in tight spaces and blend into any environment. The Christie LWU755-DS is an affordable, mid-brightness 3LCD laser projector designed for small to medium applications. 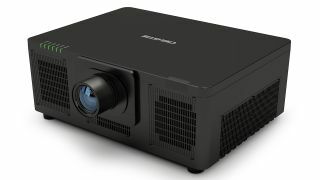 Delivering 7,550 lumens and 4,000,000:1 contrast ratio in WUXGA resolution, this projector displays a variety of content types in precise detail. Designed for easy operation, the LWU755-DS includes built-in edge blending and warping and advanced color management. Small, light, available in black or white, and featuring omnidirectional capabilities, the Christie LWU755-DS projector is easy to install in tight spaces and blends into any environment. All three models provide integration with control systems such as AMX and Crestron, and are equipped with LiveViewer so users can share audio and video content directly from their computer or laptop to the projector via the LAN or wirelessly (optional USB dongle required). The HDMI Loop-Through allows HDMI input signals up to 4K60 to be passed on to other DS Series projectors without a distribution amp/splitter. The Bottom Line: The DS Series features 360-degree orientation for flexible installation, comprehensive input/output options including HDBaseT, low maintenance, and up to 50,000 hours of operation, making it well suited for higher education, business, and mid-sized meeting spaces.